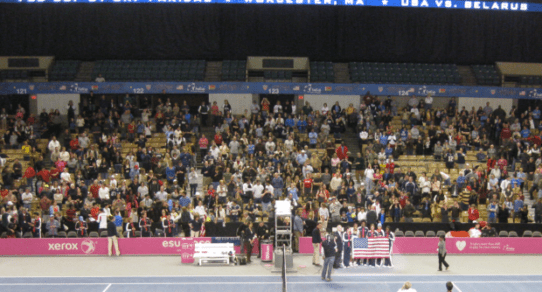 Despite being a second-tier event in Fed Cup competition, 2012’s World Group II Quarterfinal in Worcester featured three of the sport’s biggest names: Serena Williams, Venus Williams and World #1 Victoria Azarenka, who just won her first Grand Slam Singles title a week prior at the Australian Open. It was Venus and Serena’s first Fed Cup Tie in five years. Serena last played for Team USA in the Americans’ 2007 World Group Quarterfinal victory over Belgium at home in Delray Beach. Venus last played that same year, in the U.S. Fed Cup Team’s Semifinal loss to Russia in Stowe, Vermont. Not to mention, the weekend marked Venus Williams’ first event back on tour since being diagnosed with Sjogren’s Syndrome five months earlier after her 1st-Round victory at the US Open. Last year at this time, Americans Bethanie Mattek-Sands, Melanie Oudin, Liezel Huber and Vania King fell in the World Group’s 1st-Round. Behind Kim Clijsters and Yanina Wickmayer, Team Belgium dominated the Tie in Antwerp. Liezel and Vania won Team USA’s only rubber during the inconsequential doubles finale. With the loss, the Americans drew Germany in April’s World Group Playoffs, where they played on indoor clay in Stuttgart. Christina McHale, Melanie Oudin, Liezel Huber and Vania King failed to earn a single rubber off the Germans, and were relegated to World Group II to start 2012. Belarus, on the other hand, went undefeated last year. They started their run in Fed Cup’s Group I play. Behind Victoria Azarenka and Olga Govortsova, the Belarussians won all nine rubbers played over the round-robin weekend in Israel, earning a spot in the World Group II Playoffs. In April, they defeated Estonia 5-0 in Minsk to reach 2012’s World Group II 1st-Round. After a grueling fortnight, Victoria Azarenka left Melbourne as the Austrlian Open champion — her first Grand Slam Singles title. Considering the extended post-victory press blitz and 36-hour travel itinerary, by the time she reached Boston, Vika was spent. Citing injury, Azarenka settled into the role of cheerleader for the weekend. On Day-1, Christina McHale opened the weekend by earning her first Fed Cup victory in her third career Tie for Team USA. Serena put the Americans ahead 2-0 with a quick thumping of Olga Govortsova. On Day-2, after dropping the first 5-7, Serena clinched the Tie with a deciding set victory over Anastasiya Yakimova. Christina then won her second career rubber, defeating Darya Kustova — while Venus Williams teamed with Liezel Huber to secure the shut out for Team USA. It was an inspiring victory for Venus, finally back on court after a five month absence figuring out all the necessary lifestyle changes that came with her auto-immune disease diagnosis. 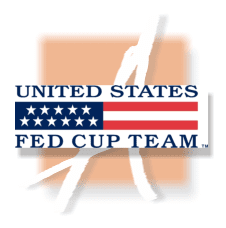 This April, Belarus will now battle to stay in World Group II for 2013 — while the U.S. Fed Cup Team will fight to rejoin Fed Cup’s top-tier during the World Group Playoffs.